SAFETY!..LED bulbs come on 140 times faster than incandescent bulbs. That’s an extra car length of reaction time & distance for the car behind you. LED’s last many times longer up to 20,000 hours!! Because they create no heat and use less energy. Great for parades and setting in shows with the tail lights or flashers on, at least 1/6 the drain on your battery. LED’s are incorporated into LENS and are direct replacement for standard shield type lights. 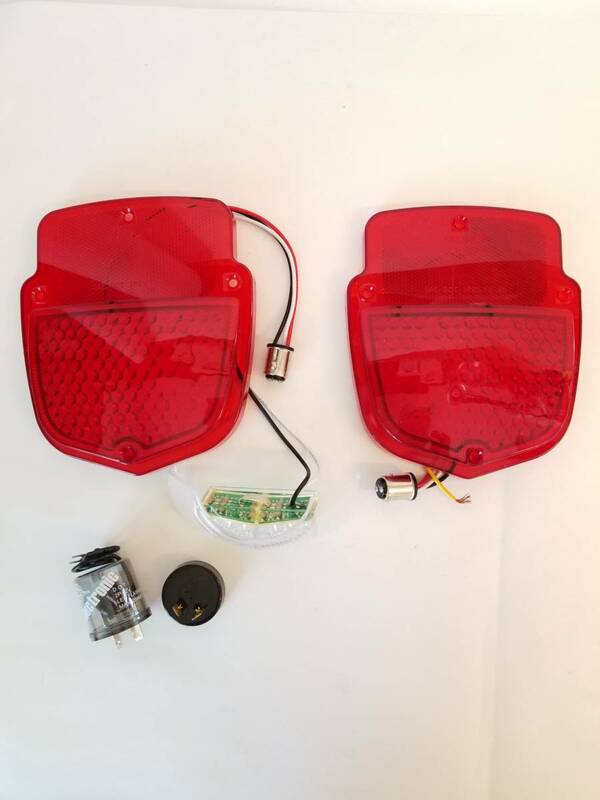 You will need our LED FLASHER 2921-S2 unless using front park lights with turn signals AND standard incandescent bulbs. (normal flashers use heat to flash and LED’s just do not draw enough current) * *2921-S3 if using add on turn signal switch that has hazards. NOTE: WE NOW HAVE SEQUENTIAL TAIL LIGHT LENS! EXTRA COOL! SEE 92216 and 92217 Sequential Awesome Assemblies. Or 2209-SL and 2209-SR Sequential Lens.